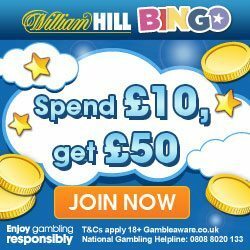 50% Refund on Slots & Scratchcards at William Hill Bingo! Get playing in William Hill’s top Bingo Rooms this weekend such as Rainbow Riches Bingo and Lucky Numbers Bingo to name a few. If you win big you’re a winner, if you don’t win you’re still a winner as you get, 50% back on house winnings up to £20 Bingo Bonus* if luck isn’t on your side! Click here to visit William Hill Bingo. *Invite only. Min losses 2p. Max £20 Bonus. Bonus Back on losses. Player restrictions, T&C and 2x Wagering apply. YES we reel-ly mean it! This weekend only, if you’re not a winner you can get 50% back on your losses up to £20. Get spinning with delight on your favourite slots, jackpot slots and Scratchcards! *Invite only. Min losses 2p. Max £20 Bonus. Bonus Back on losses. Player restrictions, T&C and 20x Wagering apply. 1. All payments will be made into your William Hill Account subject (where relevant) to all necessary account opening formalities being completed. 2. 50% Bingo Losses (the “Promotion”) will run from Friday until Sunday on the week the email/inbox/SMS/push message was received (The “Promotion Period”). 3. Please note: this is a private promotion and only available to customers who received this offer via William Hill email or inbox message. 4. The Promotion applies to William Hill Bingo play only. 5. Players will receive 50% back of their total cash losses on Bingo Tickets during the promotion period as a Bingo bonus. 6. The minimum bonus redeemable is 1p, losses of 1p (based on 50% bonus back) or less will not award a bonus. The maximum bonus redeemable is £20. 7. Bonus back amount will be calculated as 50% of players’ total cash and pending stakes on Bingo Tickets, less their total winnings from all balances. Any stakes that are settled after the promotional period and any stakes using bonus funds will not qualify for this bonus back offer. 8. Stakes will be counted from the time the stake is made, not the gameplay date. 9. Stakes made on both the Website and Mobile Bingo will count towards this Promotion. 10. Player’s bonus account will be credited within 48 hours of the promotional period ending. 11. Bingo Bonus must be turned over two (2) times prior to winnings becoming withdrawable. 12. Any unspent Bingo Bonus funds will be retrieved from players’ accounts after 1 week of payment being made. Ready to play some bingo? Sign up to William Hill here!